As expected, they were delicious, looked very cute, and were a huge hit with my coworkers. I saw this recipe in my new 125 Best Cupcake Recipes book by Julie Hasson. It reminded me of the cupcakes kids brought into school for their birthdays in elementary school so I just had to try them. I used her white cake recipe and of course, my favorite buttercrean frosting recipe. In a bowl, using an electric mixer, beat together sugar and butter until well combined. Add egg whites, one at a time, beating well after each addition. Mix in almond extract. Alternately beat in flour mixture and buttermilk, making three additions of flour mixture and two of buttermilk, beating until smooth. Fill muffin pan with flat-bottomed ice cream cones. Fill each cone three-quarters full of cake batter. Bake in preheaded oven for 25 to 30 minutes or until tops of cupcakes are golden brown and a tester inserted in center comes out clean. Let cool completely in pan on rack. 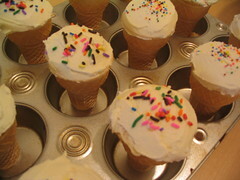 Top cooled cupcake cones with frosting. Sprinkle with garnishes. I hate almond, so I used vanilla extract instead. The cones end up a little soft due to baking. This is normal. In a large bowl, cream margarine and shortening until light and fluffy. Add salt, vanilla, confectioners’ sugar and milk. Beat well. The first time I made this frosting, I used regular water based food coloring and the colors came out extremely muted. Since then, I’ve used gel color and the colors have looked great. Awesome! I think my girl would love this “Ice-cream”! Could u post the recipe for the cupcake? BTW, most of your fosting usese “butter-flavour cisco”. I can only find the regular crisco shortening without the butter-flavour. What shall I do? Eileen, I’ll post the recipe in a bit, but you can actually use any cupcake recipe you like! Re: the butter flavor crisco. The original frosting recipe actually calls for just regular crisco, but some of the reviewers said it had a funky taste to it, so they recommmended using the butter flavor crisco. However, I know someone that made it using just the regular crisco and she said it tasted fine, so I say go for it! I would like to take these ice cream cone cupcakes to my childs school. What is the best way to transport them? Elayn, I put them in a big round Rubbermaid container. If you pack it full enough, they won’t move around. Help! I love these cupcakes and am making them for my daughter’s part next week but we live in Australia and I don’t think they sell Crisco of any kind here (can’t find it anyway). What can I use instead?? You can use any boxed cake mix and icing from a can if you are in a pinch or if you can’t find the ingredients.The confetti cakes come out really cute. I cut holes in the side of a large cereal box (alternating the hole placement so the box wasn’t too weakened). Worked great and acted as a tray.